The natural heritage divan bed Is made using a pocket spring construction which ensures extra comfort and support for a mattress. The spring section is attached to a solid timber frame for extra strength. The springs our overlaid with wool fleece and cotton padding with a covering of the latest material ticking. The base incorporates four full size drawers built in allowing for extra storage of bed linen etc. The natural heritage divan is made with cream material and the headboard is designed with a modern style divided into four, making it perfect for any style four-bedroom. 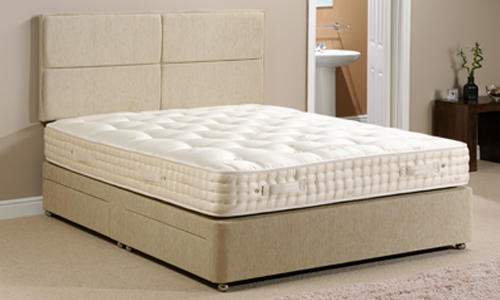 The divan bed is made from two equal sections divided across the centre of the bed. These are then attached together to give complete support and comfort over the surface of the divan. Each section of the divan is supported on small wooden feet. The Natural Heritage Supreme Mattress is made with 1,400 individual pocket springs. Each of these pocket springs are glued together to give an honeycomb nested unit. The Supreme Mattress upholstery has a top layer of 1,000g of needle cashmere. The soft springiness provided by cashmere gives the mattress an added dimension in comfort. As it is similar to wool it has the same properties in helping with ventilation and insulation, but due to the quality of this fibre it makes the mattress even more luxurious. A layer of 1500g of Wild Horse Hair is provided on either side of the pocket springs giving protection to the softer layers of fibre from the harshness of the springs. The Horse Hair is attached to a backing giving it extra strength and protection to the springs but still allowing each spring to move independently. Each panel of the mattress has a layer of Vertifill wool to a thickness of 500g. 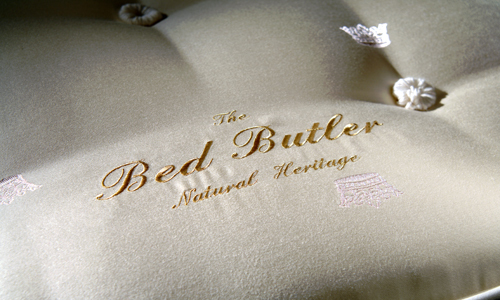 This wool gives extra loft to the mattress and therefore increasing its support and comfort. The final layer is again made from Needle Cashmere Silk to a thickness of 1250g per panel. The complete mattress is covered in FR Damask fabric and tufted with rosettes. The Natural Heritage Supreme Mattress has a Tack and Jump border which provides extra support and longer mattress life without compromising integrity of the mattress material. The Natural Heritage Supreme is hand tufted using woollen tufts to ensure comfort and a smooth finish. There are three layers of wool interliner around the mattress sides and all the corners are padded with lambs wool. The mattress has three rows of hand stitching. For ease of turning the mattress there are 6 horizontal handles around the sides, two at each side and one at each end. On the double size mattress there 8 horizontal handles, two on all four sides. There are eight vents also built into the sides of the mattress, two in each of the four sides.